Beyond a doubt, how children raised in the digital age communicate, learn and consume information is vastly different from generations before. While it had initially grown slowly, online education – apps, portals and other Internet resources – has since become a staple in enhancing children’s learning outside the classroom. Joining the digital learning landscape is teachnlearn – a live video-tutoring platform offering accessible, convenient and effective learning. 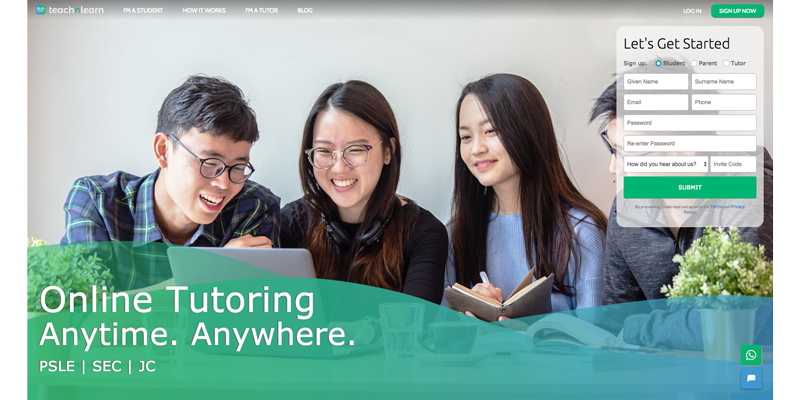 Basically, tutors and students come together onto the interactive website for one-on-one live video tutoring that can be conducted wherever, whenever. At their disposal is a user-friendly interface offering a powerful range of virtual tools such as HD video/audio chat, interactive whiteboard and screen sharing. Students will also be able to replay lessons for easy revisions and get access to tutors on various subjects (or even get answers to an urgent question), right from the comfort of their own laptops. What’s more, all tutors are verified and go through background checks. The extensive community of tutors are well versed in Singapore’s school syllabus to deliver quality teaching. And students are encouraged to evaluate each lesson and provide feedback to improve tutors’ teachings and maintain a good learning experience. Coupled with the ability to schedule their own tuition sessions, tech-savvy children can thus experience independent learning and take charge of their academic journey. Find out more about teachnlearn here!